Apologies, good friends, for the fracture of good order, the burning of paper instead of children.… our hearts give us no rest for thinking of the Land of Burning Children. The phrase ended up on banners and placards and posters as the war dragged on for seven more long years before ending in 1975. 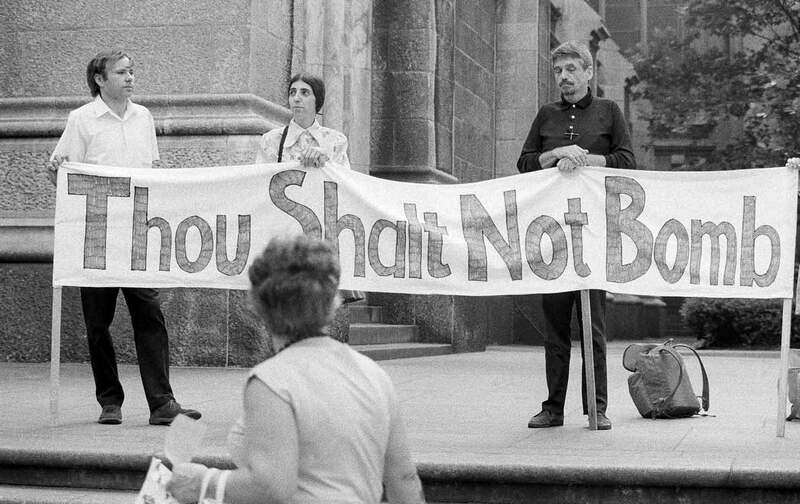 Often it was Daniel Berrigan’s brother and fellow priest, Phil, who came up with actions designed to shock the conscience over the horrors of war and the madness of nuclear weapons. (The brothers were also early supporters of the civil rights movement.) But it was Dan who colored those actions with his distinctive moral needling. He left no one off the hook, including allies on the anti-war left. Curiously, Dan Berrigan’s life began in crippled muteness. Picture a cabin under snow in the winter wilderness of the Iron Range of northern Minnesota. It’s 1925, when America still holds pockets of frontier existence. Inside, a 4-year-old boy sits splay-legged on the floor. That’s Dan, the fifth of six brothers. He’s the one with the house-pale arms, weak ankles, and a button nose pinched by awkward metal eyeglasses—the fragile exception to a broad-chested brood. Dan’s mother Freda crouches over him, strapping his feet into prescription shoes: exotic-looking contraptions made of whalebone struts encased in heavy leather. The shadow filling the doorway is his father, Tom Berrigan. He’s a railroad man and would-be poet who has versified on the need for parents to “do away with maudlin kindness” in favor of “the kindness of the rod.” And in case that’s not tragicomically tyrannical enough, Dan Berrigan would later write that it was at these moments, when the child was vulnerable on the floor, that the father would turn “Superman’s frosty eye” on him and find him wanting. Of course Dan, being 4, didn’t have the words or the prerogative to reply. So his mother would speak for him. “Leave ’im alone—he’s fine!” she’d yell in her German accent at her Irish-American husband. Tom Berrigan would then stalk out into the snow, or off to his job as a railroad engineer, which could take him away from the family for weeks at a time. Dan Berrigan learned to walk on his own around the age of 5. It doesn’t take a psychologist to note that he went on to devote his life to battling men he defined as tyrants, and to rhetorically skewering those who would defend and practice violence, a group that included his father. After the Catonsville draft board raid, Berrigan found a new authoritarian foil in J. Edgar Hoover. Or it might be more accurate to say that Hoover found him. But first J. Edgar Hoover had to look long and hard: Berrigan decided to go underground following the convictions of the so-called Catonsville Nine defendants. (Berrigan turned a transcript of their trial into a play that has been produced hundreds of times around the world and turned into a movie by Gregory Peck.) He simply didn’t report for his prison term. And creating a sensation. FBI agents hunted Berrigan up and down the East Coast in the spring and summer of 1970, always a step behind the fugitive priest when he’d pop up in a pulpit to give a sermon on peacemaking themes. Then vanish. His taunting of the bureau went on for months, like a flame beneath the pot of Hoover’s anger, which, anyway, was never far from boiling. Friends told Berrigan that on the opening night of his Catonsville play in Los Angeles, the theater played a taped message from the playwright. At the sound of Berrigan’s voice, several non-descript ticketholders leapt to their feet… then subsided into their chairs when they realized their quarry was not present to be captured. Of course Dan Berrigan’s activism long outlived the Vietnam era. He and his brother Phil went on to the lead the Plowshares movement—more than a hundred actions during which protesters have thrown blood and rained down hammer blows on nuclear weapons and components. The movement is named after the Biblical injunction to “beat swords into plowshares.” Most of its participants have done serious prison time, several of them more than once. Jim O’GradyJim O’Grady is a reporter for WNYC Radio and co-author, with Murray Polner, of Disarmed and Dangerous: The Radical Life and Times of Daniel and Philip Berrigan, Brothers in Religious Faith and Civil Disobedience.